While consumers are pleased to eliminate their drawers full of paper menus, they also don’t want a screen cluttered with food delivery apps. They want one app that covers the most choices, and GrubHub is increasingly getting a spot on their mobile device. As the location/app of choice, GRUB commands upwards of 25%-30% fee on each delivery — providing the company with huge margins. While that’s a fat fee, many restaurants find it more economical to outsource delivery because it can better adjust the supply-demand of busy time periods. Also, as mentioned, they simply cannot forgo being listed GRUB, or they risk losing customers. The real game changer is that GRUB is now expanding from focusing on independent restaurants in dense urban markets to doing deals with regional chains, such as Hurricane Grill and Sushi Samba — as well as national chains like Buffalo Wild Wings and Red Robin Gourmet. This may cut into margins but should accelerate growth and overall profitability. Even Amazon and UberEats’ entry into the food delivery business has not slowed its growth. Revenues are still growing at nearly 50% annually and may accelerate as the company, which initially targeted independent restaurants in dense urban locations, begins to sign national chains. Look for sales to top $275 million this quarter, a 41% increase over in a one-year span — over $800m for the year. 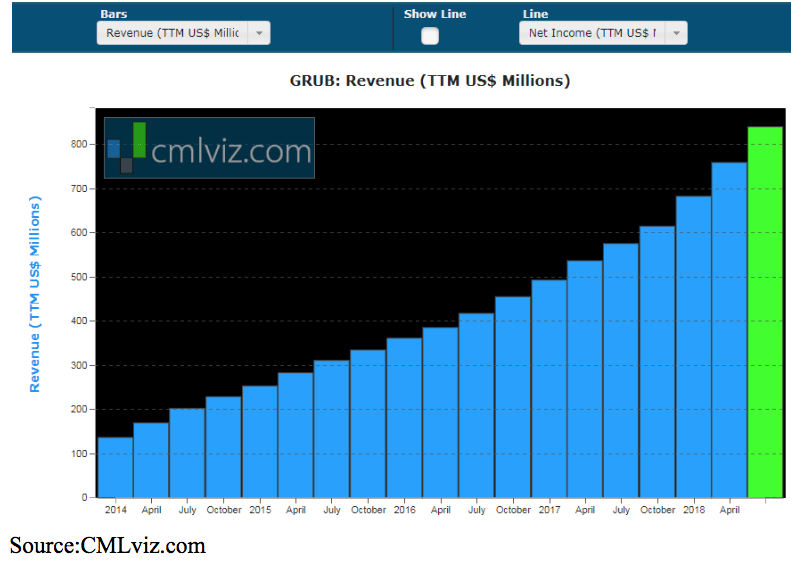 Grub still has a long runway of growth and the recent sell-off is a great opportunity to get the shares at a discount.